Parallel.Join has started its life as a very simple construct. Later it got an optional parameter of the IOmnITaskConfig type, but that didn’t change its simplicity. You called Join, it executed some code in parallel, and only when all code blocks completed its execution, your main thread would proceed by executing the statement following the Join call. Then I started to think about handling exceptions (just as I did for the Parallel.Future) and somehow this simplicity didn’t feel right to me anymore. At the same time I got involved in a prolonged discussion with Антон Алисов (Anton Alisov) and together we defined new features that new Join would have to have. All users of the 2.1 release, please download this very important hotfix. Great thanks to [Антон Алисов] for finding the problem. The main focus in the next OmniThreadLibrary release is on exception handling in high-level constructs (i.e. the OtlParallel unit). The first one to get this support is Parallel.Future. Why? Simple reason – it has a well-defined point of interaction with the owner (the Value function) and only one background task, which makes exception handling easy to implement. IOmniFuture<T> was extended with three functions. Any exception thrown in the background task and not caught in the future-calculating code will be caught by the IOmniFuture<T> implementation. When a Value is accessed, this exception will be raised in the owner thread. As it turned out, two of them are not necessary anymore. Since the introduction of the taskConfig parameter, termination procedure can also be specified by setting taskConfig.OnTerminated. Yes, it is ready. Get the ZIP or check it from SVN. If you’re following the trunk, do the update. You’ll actually get more than 2.1 as I’ve already merged in development branch with support for exception handling in Parallel.Future and Parallel.Join. Warning – those changes may break the code as two version of Parallel.Async were removed. Check the history.txt and documentation in OtlParallel.pas for more info. This time you can also download full UML diagrams for OmniThreadLibrary, courtesy of Rich Shealer. 2.1 release should be mostly non-breaking, except for changes in OtlHook exception filtering mechanism and removed EXIT_EXCEPTION exit code (see below for more info). I’d like to thank dottor_jeckill, Rico Krasowski, vcldeveloper and TOndrej, who helped make this release even more awesomer. 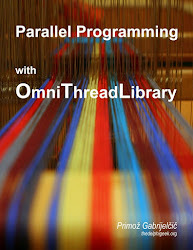 After a long long wait (sorry folks, due to events out of my control this release took many months longer that I expected) OmniThreadLibrary 2.1 is finally ready! I’m just putting together change log, testing demos to see if everything is working as it should and so on … A day or two and it will be packed and ready to go. If you’re impatient, just go ahead and check out the current version from the SVN – all the code is already in there. I have a small favor to ask, though. If you’re using OmniThreadLibrary in D2009 or D2010 – can you please make sure that all tests are included in the appropriate Tests.<version>.groupproj file (and create missing <project name>.<version>.dproj files in the process)? And send the changes to me, of course – my email address is in OTL source files. It would be best if you can leave a comment here if you choose to help me so that the work won’t be duplicated by other programmers. EDIT: D2010 projects and updated test group are now in the repository, thanks to [vcldeveloper]. EDIT: D2009 projects and updated test group are now in the repository, thanks to [TOndrej].